If you’ve ever thought to yourself, ‘the grass is greener on my neighbour’s side of the fence’, it might be because they’ve got artificial grass installed. Contrary to what most people who have never used an artificial grass think, it’s very hard to distinguish between a natural lawn and artificial grass. Here at Great Grass, we have a variety of different types of artificial grass depending on what you’re looking for, but all of them look natural. That’s because we use a blend of different pile heights, colours and blends to create the lawn. We even have a type of artificial grass named “natural” which, as the name suggests, gives the most natural looking finished product. What’s more, artificial grass is a great option if you have children or pets. A lot of people think that pets such as dogs or cats don’t like artificial grass; that they can tell the difference through touch or smell, but it’s just not true! In fact, dogs and cats love artificial grass and even better for you it makes cleaning up after them even easier. When it comes to children, they’ll love being able to play out in the garden no matter what the weather and with artificial grass, there’s no need to worry about them tracking mud into the house. Smiling faces all around! 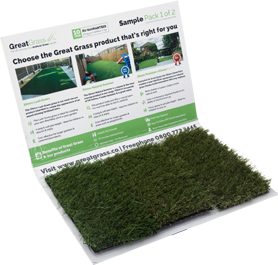 For more information on our range of artificial grass have a look around our website or give us a call.